The Museum was once the headquarters of the Bronson-Weston (formerly the Bronson Harris) Lumber Company which was in operation in the North Hastings area beginning in 1856. The Company’s head office was originally situated eight miles east of town in Dungannon Township. Although there is no accurate accounting that exists to tell us where the first part of the Museum was built, signatures on the inside of the logs of the Museum’s main structure are dates 1879. It is estimated that the smaller section of the Museum could have been built as early as 1850 in order to satisfy Crown land settlement requirements. The Museum itself contains ten rooms of the community’s history and has a remarkable 3040 square feet of display area. Contained within the Museum are a dining room, parlour, kitchen, and two bedrooms furnished in the style of the late 19th and early 20th centuries. After the Lumber Company ceased operations, the productive farm and outbuilding continued to be used by various families over the next few succeeding generations. In 1965, as Canada’s Centennial approached, a group of interested citizens recognized the potential of these two buildings as a museum. 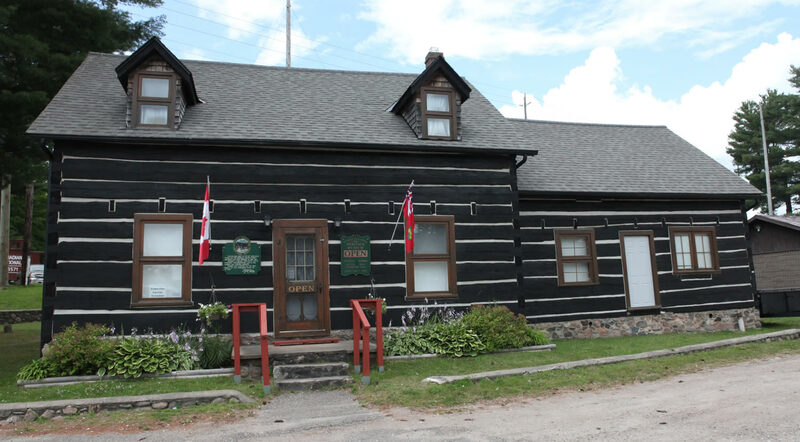 Through their volunteer efforts and with the support of the community, the log buildings were moved to their present site on Station St., in Bancroft. The Museum was officially opened by Mr. J. Churcher on July 1, 1967. Since its opening the Museum has been visited and enjoyed by people from all over the world, including people from the countries of New Zealand, Australia, England, France, East and West Germany, Poland, Korea, Japan, China, U.S.S.R., and the United States. On July 1st, 1994 a new addition was opened. The matching Dovetail logs were supplied by Confederation Log Homes and constructed by Jim Richard contractor. This gives the museum a large storage room, wheelchair access bathroom, work area and office. It was made possible by a Grant under the Cultural Facilities Program, Ministry of Culture, Tourism and Recreation Province of Ontario and the generous support of the Municipality of the Village of Bancroft. It was dedicated to the memory of Past Board Members, whose devotion, perseverance, dedication and vision made this North Hastings Heritage Museum possible. A large oak plaque adorns the wall giving their names. Almost all of the articles in the Museum collection have been donated by the people of North Hastings area and reflect the character of the people and the history of North Hastings. A collection of lumbering and agricultural tools housed in the museum’s tool room reflects the importance of this aspect of pioneer life to the survival of settlement in the North Hastings area. A model logging special feature of this section is a scene carved by Henry Taylor. The Museum also contains a loft exhibition gallery in which special thematic exhibits relating to area history are displayed. Completed in 1989 is a special Exhibition tribute to the pioneering men and women of Medicine and Dentistry in North Hastings. The exhibit includes dental equipment from Dr. Harryett & Dr. Fonger’s offices; Dr. Alexander Thomas Embury’s W.W.1 field surgical kit, Dr. S.S. Lumb’s beaver coat, Dr. Hardingses’ typewriter and medication, Dr. O.W. Anderson’s medical bag, and a selection of early medical instruments donated by the Bancroft Red Cross Society. The Exhibit also includes pictures & history regarding each professional and his contribution to North Hastings. A collection of pictures and documents in the Museum’s document room depicts Bancroft and area at various times in the past. A special feature of the museum is a selection of minerals from the extensive collection of Harold Petch. Also available to the public for genealogical research, is a record file of the main frame of pioneer settlement in the Bancroft area. **Disclaimer : Hours of operation may change. Please contact the organization to verify.